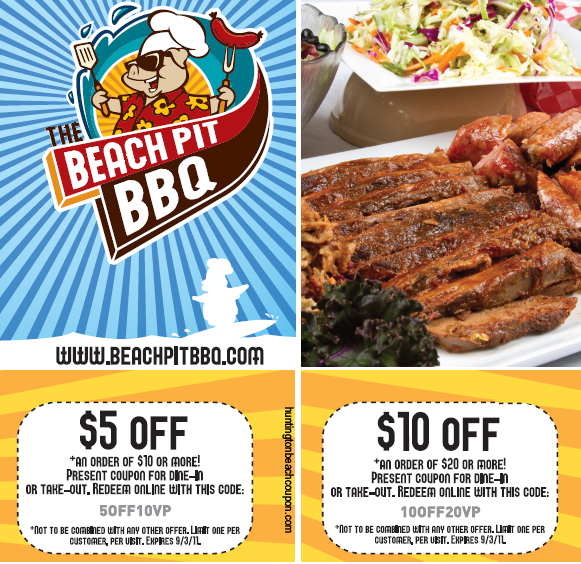 The same great smoked ribs, chicken, pork and beef once served by Smokin' Mo's BBQ is not presented in a delicious and affordable menu from Beach Pit BBQ located on Main Street in Huntington Beach, CA. We've tried various menu items and always prefer the smoked half a BBQ chicken which comes with your choice of a side such as cole slaw or baked BBQ beans. The beans are exceptional, offering a mixture of dark and medium beans, pieces of tomato and just the right amount of spices that combine sweet with a little tiny kick. Whatever you order from the sandwich or plate menu is delicious if you like smoked meats. They use a smoker to cook the foods to perfection and those unfamiliar with the pink color that chicken acquires from smoking may be confused into thinking the meat is not done. Oh, contrare! The meat is quite well done when it's pink in this form of cooking and it's finger licking good, with the scent of the smoke flavors sticking to your hands even after you wash them. The sweet potato fries are one of our favorites, but are best eaten in the restaurant or re-heated in an oven when taken home in a take-out order. They come with a little cup of dipping sauce, a traditional Ranch dressing recipe. If you don't have the sauce, you'll cut a few calories, but definitely dip! The combo of the sweet flavor in the potatoes is offset by the slight tang of the Ranch to make for the perfect balance on your taste buds. The restaurant features indoor, very casual seating with Southern themed BBQ pictures on the walls, a pig riding a surfboard on the ceiling, and an order counter you go to when you arrive, then sit down with a table number for your food to be brought to your table. A drink bar serves up tea and beverages, and the place also sells beer. The price of a lunch sandwich and beverage usually costs around $10-12. Dinner is slightly higher unless you order off the sandwich menu served all day and evening. There's also outdoor patio seating overlooking lively Main Street. There's never a dull moment when you dine outdoors with people passing by and cars driving along the "Main drag".